Offer for intermediate and advanced level. 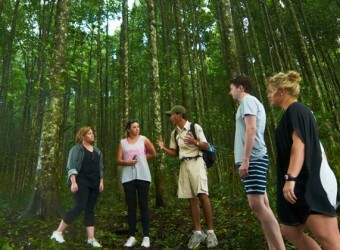 Bali Activity We offer middle level to high level jungle trekking. Trekk into Bali rain forest in Bedugul which is full of various beautiful flora and fauna, with fresh air and amazing panorama. After visiting Balinese traditional house, fields and other beautiful sceneries then trek into the jungle. Continued to the Lake Bratan where you get traditional canoe adventure. * Highly recommended to bring mosquito repellent cream and wear long-sleeved clothing. * Recommended to bring sport shoes or trekking shoes. * Trekking depending on weather and land conditions. ・Coffee and tea are available. Trekking starts from start point at Bedugul. ・Keep your valuables by yourself and keep your belongings in the car. ・A bottle of mineral water for each participant. Balinese traditional house and fields. ・You can see Balinese traditional kitchen, bedroom, family temple. ・You can also view vegetables, coffee and other plantations and Bali crops. ・We will meet the first crossroad where we can choose challenge trekking or easy trekking. ・After 20 minutes walk we will meet the second crossroad to easy trekking and challenge trekking. The participants can choose one of them, challenge or easy. ・Relax a few times on the way of trip. ・Transfer to the Lake Bratan. Experience canoe adventure on Lake Bratan. ・Canoe adventure on the Lake Bratan for about 30 minutes. ・You can see Ulun Danu Bratan Temple. ・Lunch at the restaurant after enjoy canoe adventure. It takes a minute to the restaurant on foot. ・Lunch at a 2-floor restaurant in front of Lake Bratan. Lunch buffet at Mentari Restaurant in front of Lake Beratan. I joined jungle trekking, and I bought long sleeves shirt and long pants one day before trekking. I borrowed shoes from my friend. Bali was hot this time. However it was cool when I got into the forest. I could hear birdsongs and the cries of cicadas. There are many trees and flowers in the jungle that I saw for the first time. It was very interesting. Spa after trekking was great! Package of trekking and spa is very good.